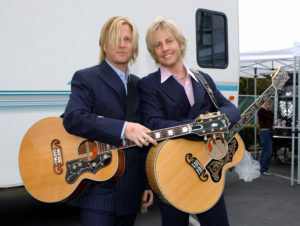 “RICKY NELSON REMEMBERED” is a unique multi media entertainment event featuring the live music of Ricky Nelson’s hit songs (including “Hello Mary Lou”, “Travelin’ Man”, “Garden Party”) performed by Ricky’s own twin sons Matthew & Gunnar and includes never before seen big screen video footage of the NELSON family with interviews from celebrities influenced by Ricky Nelson. The show appeals to a wide audience and multiple generations and celebrates the life of America’s original ‘Teen Idol’. This year 2018 marks the 33rd anniversary of Rick Nelson’s passing in a tragic New Year’s Eve plane crash.